It is said that Asia is the continent that will shape the future of our planet. Constantly evolving, the sheer size and diversity of the region is home to some of the most breathtaking and extreme geography, deep-rooted culture and traditions, tragic loss and compelling human stories of strength and community. Filled with tales from the awe-inspiring and victorious to those of struggle and heartbreak, ASIAN Geographic Magazine transports its readers into the deepest depths of Asia. The magazine's intrepid writers and award-winning photographers explore the unexplored, they document the unseen. Learn how to survive in 'Avalanche – A basic survival kit', be taken on a journey to enlightenment in photo-feature 'Retracing the Life of Buddha', and follow explorers as they look for the happiest people on the planet on a trek to Tenna Island. The Ni-Vanatu people live in constant danger from flying ‘volcano bombs’ from their molten lava home – yet they are recognised as the happiest people on the planet. What are their secrets? ASIAN Geographic brings you the answers, and so much more. Each issue dedicates 16-pages to a unique travel section called PASSPORT. Truly authentic, PASSPORT presents destinations as experienced by the natives who have lived their whole lives devouring what their homes have to offer. Read about an architect's favourite buildings in his home-town of Ankara, Turkey; or gain a local insight into the transition from Bombay to Mumbai as told by local conservationist. 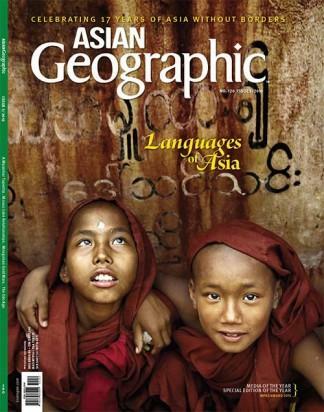 Be the first person to tell us what you think about Asian Geographic and you'll save £2.50 on your next purchase!